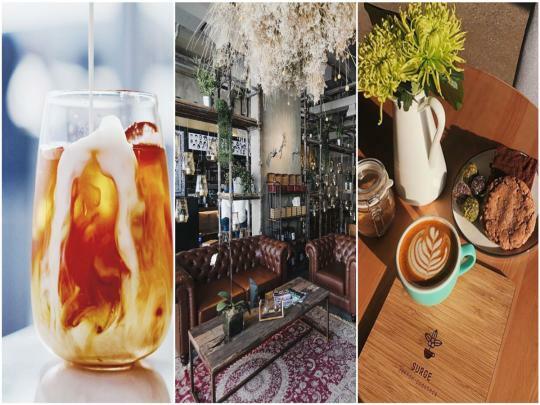 The recently opened coffee shop has two locations in Dubai. One in Al Qouz and the other right on Al Wasl Road. They serve specialty coffee as well as coffee beans and machines. The spot is so insanely instagrammable, with Persian carpets and leather couches in an industrial setting. The menu is very simple with its five sections: Black, White, Manual, Cold and Roasted. Located in a massive and beautiful villa in Jumeirah (there’s even a pool!) Alchemy is a home-grown coffee shop, where the coffee is sourced from ethical single farms. The space itself is the perfect backdrop for your Instagram. It feels like you’re in your (much more) stylish home away from home, with geometric marble counters and sleek light wood furniture and of course, great coffee. Located in Dubai’s best-kept secret location, the leisure destination called Marina Cubes, Pastryology is a recently opened coffee and treat shop with unique caffeine beverages and delicious mini cakes. The shop is built within a container and decorated in the most beautiful pastel colours. It has uninterrupted views of the sea and is all-around stunning to look at. This roaster mainly offers coffee consultation services as well as training sessions, but they have their very own coffee shop, so you know you are getting expert coffee. The venue is industrial chic and has an extensive coffee menu as well as a nice selection of cakes and cafe food. One of Dubai’s hidden café gems, Boston Lane. Owned by Australian expats and inspired by Melbourne's laneway coffee culture, Boston Lane is tucked away in the Courtyard, Al Quoz and boasts great coffee. The venue itself is so instagrammable and a great spot for some breakfast. But make sure you grab yourself a latte. This cosy hangout Izu Brasserie & Bakery, located inside Le BHV Marais at City Walk is the perfect place to meet up with friends for a casual coffee, a leisurely breakfast, afternoon snack, dinner, or anytime in between. All coffee beans at IZU are grown in Ethiopia 3000 – 5000 ft above sea level. They is farmed using traditional methods, imported fresh and roasted locally in Dubai. The one to try here at IZU Brasserie & Bakery is Beetroot latte with a shot of espresso. This little coffee shop takes up a nice corner in the Sustainable City. With comfy seats and floor to ceiling windows, Spill the Bean is a great place to work. There’s also lots of plugs, free Wi-Fi and the place is usually very quiet - not to mention the great food and coffee. Kuttab Publishing has a bookstore cafe, which is very Arabic centric. A lot of the books are Arabic and include a vast range of books from children’s literature to deep Arabic philosophy. There are of course some English books, but this cafe is a perfect place to sit and enjoy a quiet cup of coffee. It has a super cool and modern Arabic design and is a great place to sit to enjoy a coffee and a good book. Arabian Tea House Restaurant & Café located in the Bastakiya area of old Dubai is a mix of the traditional and the modern. Located in an old wind tower house, right in the heart of Dubai, stepping into the cafe takes you back to the past. Although there has been a rapid development around Batakiya, Basta has remained untouched and is probably one of a few places where you can get a look at the rich cultural heritage of the Emirati people. Yes it is a tea house, but they also serve great coffee and karak. Most importantly, if you love a picturesque venue, then you'll fall in love with the vintage outdoor area and little garden. Located in old Dubai, near the old Dubai Museum in the heart of Bastakiya.